Home / LIFESTYLES / PLANTING WITH A PURPOSE TO GROW AWARENESS OF WORLD ENVIRONMENT DAY 2018! PLANTING WITH A PURPOSE TO GROW AWARENESS OF WORLD ENVIRONMENT DAY 2018! 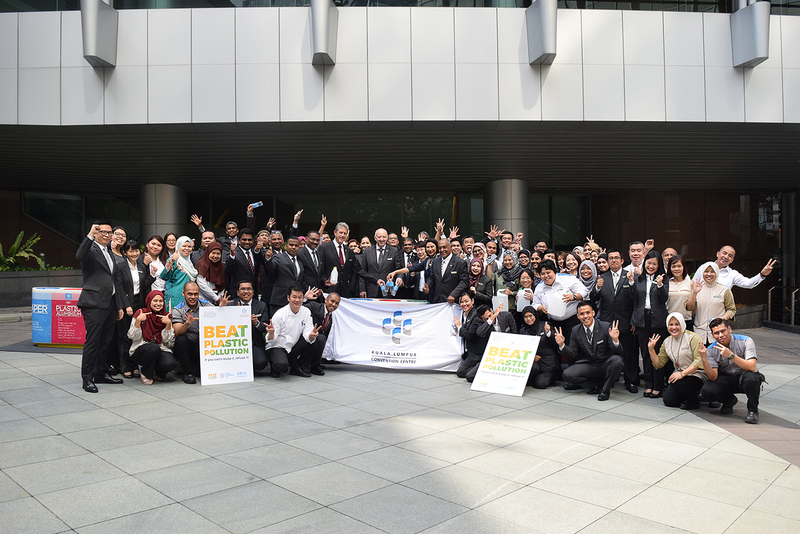 The Kuala Lumpur Convention Centre’s team members celebrating World Environment Day 2018 after spending the morning planting a variety of flora around the venue. About the Kuala Lumpur Convention Centre In conjunction with World Environment Day 2018, close to 60 of the Kuala Lumpur Convention Centre’s (the Centre) team members spent the morning planting a variety of flora around the venue. In line with this year’s theme, ‘Beating Plastic Pollution’, the planting materials used were made from recycled plastic. To mark the 2018 theme, the Centre’s Safety, Health and Environment Division will also kick off an initiative to encourage all team members to bring in plastic waste to be recycled and disposed of in a responsible manner. World Environment Day 2018, which was celebrated on 5 June, provides a platform for action and is the UN's most important day for encouraging worldwide awareness and action for the protection of our environment. Since it began in 1974, it has grown to become a global platform for public outreach that is widely celebrated in over 100 countries. The Kuala Lumpur Convention Centre (the Centre) is a component of the Kuala Lumpur City Centre (KLCC). The Centre is owned by Kuala Lumpur Convention Centre Sdn Bhd (“Owner”) and manged and operated by Convex Malaysia Sdn Bhd (“Manager”), a joint-venture company between KLCC (Holdings) Sdn Bhd and AEG Ogden. A winner of numerous awards, this world-class facility is wholly-owned by Kuala Lumpur Convention Centre Sdn Bhd which in turn, is owned by KLCC (Holdings) Sdn Bhd, a subsidiary of Petroliam Nasional Berhad (PETRONAS). The Centre has ISO 9001, ISO 22000, ISO 14001 and OHSAS 18001 certifications, EarthCheck Bronze status (environment) and Hazard Analysis and Critical Control Points Certification (HACCP) recognition, the international food safety system for international convention facilities and five-star hotels. It is also the first in Asia to receive the ‘Gold’ AIPC Quality Standards certification. Comprising two auditoria (seating 3,000 and 500 respectively), 12,310 sqm of Exhibition Halls including a 2,600 sqm standalone marquee, a Grand Ballroom which seats 2,000 diners, a Banquet Hall for 500, a Conference Hall for 1,800 and 20 other meeting rooms, the Centre provides 22,659 sqm of function space in the heart of Kuala Lumpur.